Multi-bitrate mobile audio with file conversion and mobile detection for HTML5 audio. 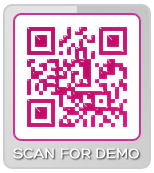 Mobile audio can be triggered from a 2D barcode or from a link in a mobile landing page. Both options are direct to content. Use mobile audio to reach more devices with the highest quality audio possible. Scan the code for Voice Over Reel.